The common Sydney octopus does not look like a happy chappy, but he always looks gloomy. It is just the way he is. Not doing so well in the sea around New South Wales he has moved down to the cooler waters off Tasmania. Because they increased in number from a few early arrivals their genetic diversity is less than those on the east coast. More are arriving from NSW and Victoria so things are improving. The exodus began in the mid-2000s. A joint project between James Cook University, the Centre for Marine Socioecology (CMS) at the University of Tasmania and the Institute for Marine and Antarctic Studies (IMAS) is researching the genetics of the species. Gloomy octopuses have been found as far south as the waters near Hobart. A new study, published in the journal Scientific Reports, suggests the species is thriving in Tasmanian waters with a healthy mix of genes from local and interstate populations. The species, also referred to as the common Sydney octopus, or octopus tetricus — but mostly known as the gloomy octopus because of its downcast appearance — has been riding the East Australian Current south to the warming waters of Tasmania, after previously being confined to eastern Australia. Research on one of the marine world's saddest looking creatures suggests things are not actually all that grim for the gloomy octopus. Gloomy octopuses were first spotted in the mid-2000s by Tasmanian fishermen and citizen scientists through the Redmap project, which invites Australians to share sightings of uncommon species in an effort to map which ones are extending their habitats in response to ocean warming. Scientists from the Institute for Marine and Antarctic Studies (IMAS) and the Centre for Marine Socioecology (CMS) at the University of Tasmania have been working with James Cook University to examine the changing genetics of the species. Dr Jorge Ramos, who led the study as part of his PhD research at IMAS, said the octopus provided a "good opportunity to examine what genetic process may allow marine range-shifting species to establish and persist in recently colonised areas due to oceanic warming". "But also to see was there any evidence of things like a really big genetic bottleneck, or a really reduced level of genetic diversity in the population." "And we really don't have a lot of information about what that means for the genetic composition of these populations. Dr Gretta Pecl from the CMS said the species was among thousands spreading its populations all over the world as a result of climate change. "We were looking at the octopus partly to get an indication of whether it had lived here before. Associate Professor Jan Strugnell from James Cook University said the research did uncover some reduced diversity in southern populations. 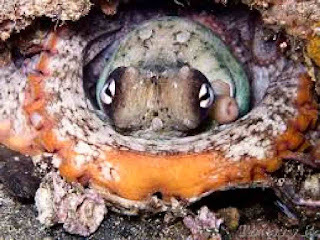 Octopus growing 'happily, healthily' A gloomy octopus with its eyes closed "Surprisingly, even though genetic bottlenecks were detected, genetic diversity was moderate and comparable between populations from their usual home and the new place," she said. Professor Pecl said there was evidence more animals were migrating south all the time, providing new genetic material.